Harris has a message: It can happen to you! Brian Harris is shown at a 2001 NASCAR All-Star Series race in Harlan, Iowa. Phil Roberts Photo. Dirt Late Model driver Brian Harris has a message for fellow competitors: Don’t take your safety for granted. Accidents will happen, and they can happen to you. Harris knows. The Davenport, Iowa, native who now lives in Walcott, Iowa, was in a devastating crash Sept. 22, 2007, at the West Liberty (Iowa) Raceway. He was leading the Liberty 100 on the dirt half-mile when tragedy struck on lap 68. “We were lapping some cars, and the track was rubbered up, so everyone was kind of single file,” Harris recalls. The impact spun his car around, and the driver’s side hit the concrete wall hard. At the time, Harris Racing, which was owned by Brian Harris’ parents, Allen and Karen, had two cars. One had a full containment seat, which adds support for a driver’s shoulders, head and neck. The other did not. The night of Harris’ crash, he was piloting the car without the state-of-the-art seat, and the left side of his helmeted head hit the roll bar when the car struck the wall. In addition to the head trauma, Harris broke the C2 vertebra in his neck, which forms the pivot upon which the first cervical vertebra, which carries the head, rotates. The head injury and broken neck, which could have ended Harris’ driving career – or worse, put him in the hospital for two weeks and abruptly ended his 2007 racing season, eliminating him from a possible World Dirt Racing League (WDRL) points title. Following the sheet time, there were two months of rehabilitation. But Harris made a full recovery and has had no recurring problems from the head trauma and no paralysis from the broken neck. “It could have been a lot worse than what it was,” Harris admits. Harris, 31, began racing go-karts at the age of 10. When he was about 17, he moved to Legends cars for a season. Then he spent a season racing a Late Model on the asphalt at Hawkeye Downs in Cedar Rapids. Dirt Late Model driving legend Gary Webb, a family friend with a wealth of racing knowledge and lots of contacts, “helped us get our first Dirt Late Model car,” says Harris. Harris raced an IMCA Late Model with a spec motor his first season on dirt. Then the team branched out with an open engine and competed in WDRL and other series, racing weekly when possible at the same time. His biggest years, Harris says, were 2007 – despite the crash – and 2008. The success included a World of Outlaws win in 2007 and contention for the WDRL title until the wreck sidelined him. His success in 2008 came ultimately with NASCAR. Harris says he started the season with WDRL but left about five races into it because the series had lost its title sponsor and had not yet announced its year-end point fund. So he decided to run the NASCAR Whelen All-American Series, competing weekly at the tracks at Farley, West Liberty and Dubuque, Iowa. He almost captured the series’ national championship. “We went after that thing pretty hard, and we came up a few points short,” Harris says. Harris ended up second, two points back (955 to 953), to the winner, Ruckersville, Va., driver Philip Morris. Harris had 20 series wins, 35 top fives and 36 top 10s in 38 starts, winning track championships at Farley and West Liberty along the way. “It was a very neat opportunity to race that deal,” he says. One benefit, he adds, was seeing first hand how well NASCAR treats its champions and “meeting a lot of new, interesting people that you see on TV” at the series awards banquet that November in Las Vegas. There were big changes for Harris Racing in the 2009 season. It closed up shop. “We sold our cars because of the way the economy was,” Harris says. Harris wasn’t without a ride for long. He had driven the Ray Neltner-owned No. 75 car a little in 2008, he says. 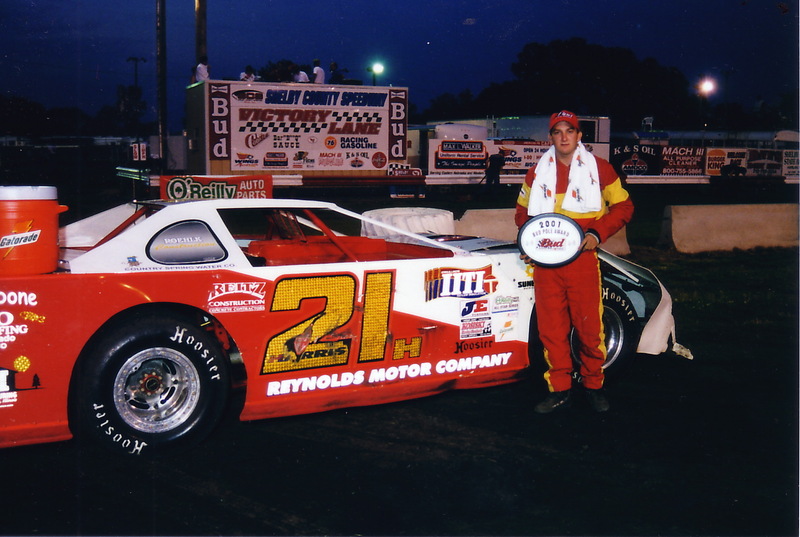 A working relationship developed, and Harris drove the Late Model at Peoria Speedway and at some special events in eastern Iowa in 2009. The weekly races in Peoria were a big change for a guy who grew up racing the big Iowa half miles at Davenport, West Liberty and Farley. Though Harris no longer had to turn wrenches as he had done at the family racing operation, he did have to learn how to communicate with a new crew. But it was a good experience. He also says the season was rewarding. In addition to the 75 car, Harris drove a competitive Modified car out of Peoria once in a while in 2009 and won a feature in it at Farmer City, Ill., with it. “That was neat. That was fun,” he says. At press time, Harris is talking with various car owners, including Neltner, about the 2010 season but hasn’t yet made a driving commitment. As an Iowa winter plays out, he also is reflecting on the support he received following his 2007 wreck. For a full six months after the crash, he received cards, calls and e-mails from well-wishers, many of whom he didn’t even know. “I have a room in my house where I have a lot of my racing stuff,” he says. “And I go through that stuff. It meant a lot then, and it still means a lot today. Harris is also preaching racing safety. “After an accident like that, you look at that safety stuff quite a bit differently,” he notes. “And you’ve got to just spread the word a little bit. Copyright 2010 by Phil Roberts, Creative Enterprises. This article was published in Late Model Illustrated magazine.